Compare with the best classic wedge designs such as Cleveland’s® Golf 900 Form Forged Gun Metal Wedges at $129.00 each! 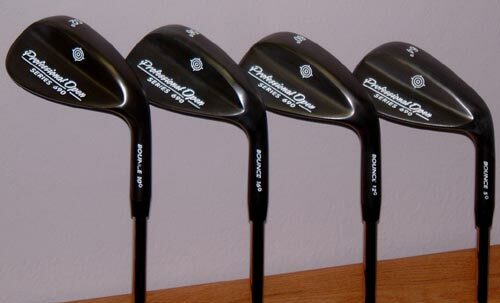 For less than one Cleveland Wedge, you get a set of four PO 690 wedges. The PO 690 wedges feature great playability and a non-glare black finish! Looks great and plays like a winner! Built with high quality stepped steel shaft with a low to mid kick point. Standard Soft Grips featuring an ultra soft compound that is firm enough to prevent twisting for a great feel in your hands. Heat treated in black milonite for a unique, non-glare finish and a slightly softer feel. Black milonite is extremely durable and will provide many years of quality play. For more details about the Interloper PO 690 Black Set of four Black Wedges, click here.